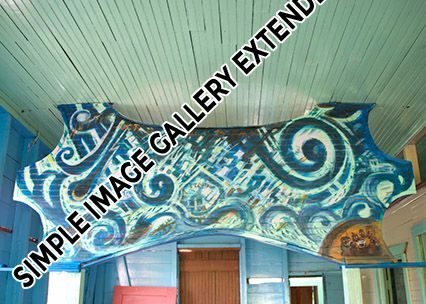 A mural is any piece of artwork painted or applied directly on a wall, ceiling or other large permanent surface. Private commissions can be for dining rooms, bathrooms or living rooms. 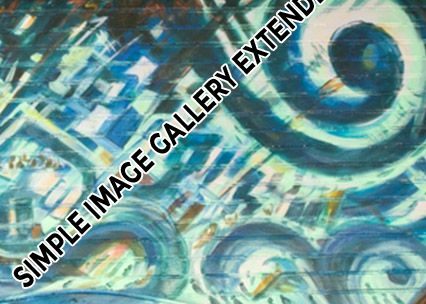 A large hand-painted mural can be designed on a specific theme, incorporate personal images and elements and may be altered during the course of painting it. 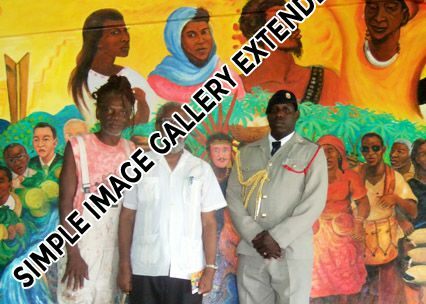 Public commissions of murals in schools, hospitals and community centers can achieve a pleasing and welcoming atmosphere. 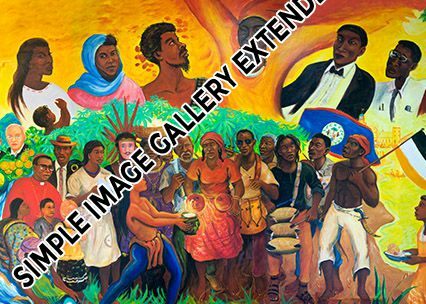 Hayawadina Wayunagu is the Garifuna name for Pen Cayetano’s most ambitious masterpiece at the Dangriga Town Hall. Literally it means the “imagery of our ancestors“. This monumental work of art is Pen’s personal testament about persons who have inspired him in his varied interests in the fields of history, culture, spirituality, and artistic performance. 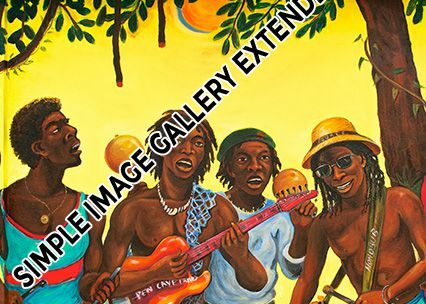 In the dynamic field of culture he pays tribute to persons who have been pioneers in the documentation and dissemination of the good news of the survival of the Garifuna nation. He pays similar respect to persons – living and dead - who have been leaders in spirituality – both Garifuna and non-Garifuna. In the field of the performing arts include music, dance, poetry, drama, and folklore. 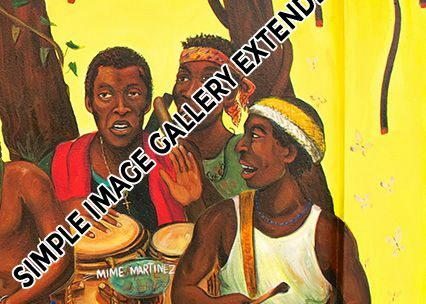 Through such imagery Pen gives full endorsement to the UNESCO 2001 Proclamation of Garifuna language, music and dance as masterpiece of the oral and intangible heritage of all humankind. 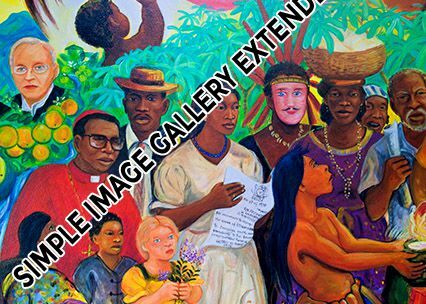 Other themes are inter-ethnicity toward the forging of a common Belizean identity and inter-generational continuity. The Maya, Mestizo, Kriol, Chinese, and Caucasian are shown interacting in various ways with the Garinagu. Indeed, inter-ethnicity and inter-generational continuity come vividly alive in Pen’s depiction of his own family consisting of his wife German Ingrid, an artist in her own right, and their three children, all of whom work in various aspects of art and music. 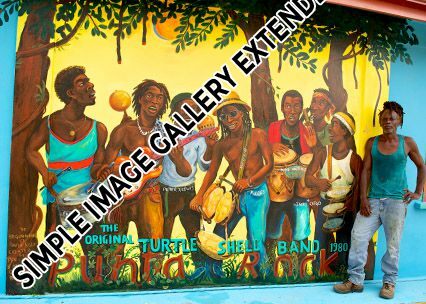 Pen Cayetano, a master painter and originator of Belize Punta Rock music has lived most of his life painting, drawing, singing, developing and playing musical instruments (such as the turtle shell), leading his own band, teaching, and generally advocating for artistic freedom for persons at the grassroots alive and beyond. 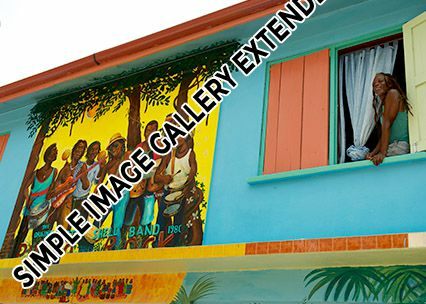 Pen Cayetano’s mural at the UBAD Educational Foundation Library of African and Indian Studies ‘Power to the People’ in Belize City is a masterpiece of Belizean history, a journey from roots to cosmos. 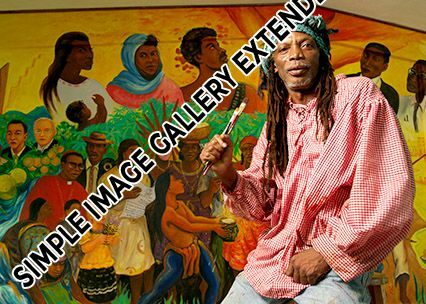 The mural completed in 2003 adorns the wall of the Library of African and Indian Studies and shows the dynamic history of United Black Association for Development and its leader, visionary and giant in Belizean letters writer Evan X Hyde communing with the cosmos and the roots and writing the path to freedom. 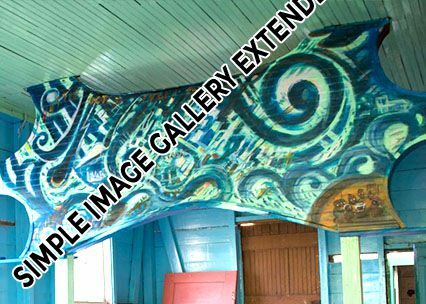 This masterfully painted mural starts from the roots of the swamps of Belize City filled with johnny fiddler crabs and broken rum bottles symbols of the city’s landscape and history, the darkness from which all light comes, and grows into the people searching for their freedom to the person of Evan X Hyde writing from the energy of the universe to civilization to write his visions in Amandala newspaper the leading newspaper in the nation to educate and enlighten the masses to the reality in which they live and ultimately to liberate the mind. 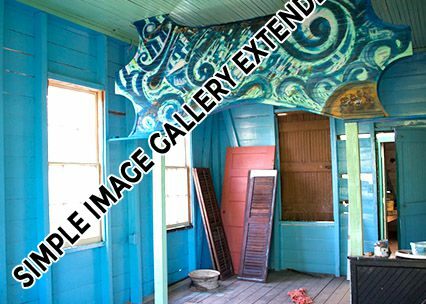 Pen Cayetano’s genius is his ability to capture the dynamism of the whole circle that goes from the cosmos to the roots and the roots to the cosmos in a circle of energy that travels the Belize City landscape in a harmony of colors fire yellows and vibrant blues and earth browns and share the feeling of movement from the darkness of jail that imprisons the body to the freedom of the light of the sun in which new visions can be born. ‘Power to the People’ is a tour de force of Belizean art at the Library of African and Indian Studies a space of freedom, a masterpiece of our history that sings an artist’s vision of Belize’s history, present and future, an important part of the puzzle that harmonizes the whole vision of Belize’s truth, a light of the globe, the New Jerusalem where God is expressing his Ummah.